For the businesswoman, see Sonali Kulkarni (businesswoman). Not to be confused with Sonalee Kulkarni. Sonali Kulkarni first made her appearance on the screen in a Kannada film titled Cheluvi, directed by Girish Karnad. She has appeared in many films including an Italian film titled Fuoco Su di Me, for which she won an award in the 2006 Milan International Film Festival. She has received a Special Jury Award (non-feature) in the 49th National Film Awards (2002) for her role in a short film in Marathi; Chaitra. Apart from acting, she was an editor with Viva, a supplement of Marathi daily newspaper Loksatta from June 2005 till May 2007. She used to pen a weekly column called "So Kool". The columns are published in the book So Kool by Rajahansa Prakashan. Actor Nana Patekar on the release of this book said, "Whenever I read her articles, I feel she is talking to me. There is so much of simplicity in her writing." Kulkarni showed her dancing skills in the second season of the popular celebrity-dance competition show Jhalak Dikhhla Jaa on Sony TV.Kulkarni will be seen in a yet to be named Netflix thriller soon. She has also worked with Doordarshan channel and did some films like Gulabari in 1994 in Hindi which telecast in 1995 and Kata Rute Kunala in 1996 in Marathi, for which she has also got RAPA Award-Best television performance of the year. She was also seen in one story (Kya Yahi Pyaar Hai - Directed by Tanuja Chaturvedi) of Star Bestsellers TV Series telecast in 1999-2000 on Star Plus. Kulkarni was born in Pune, Maharashtra. Her father is an engineer and she has two brothers: Sandeep and Sandesh. She completed her schooling from Abhinava Vidyalaya and did her graduation from Ferguson College, where she majored in Political Science and got a scholarship in Marathi literature. For her interest in acting she attended a workshop by Satyadev Dubey after which she and Sandesh formed a theater group called Samanvay. Sandesh is now a film director. Sonali's first brief marriage with Chandrakant Kulkarni, film and theatre director and writer, ended in a divorce. Since 24 May 2010 she is married to Nachiket Pantvaidya, current head of Sony Entertainment Television. Sonali's first movie was Cheluvi, aka the Flowering Tree (1992). The film is based on a Karnataka folk tale. Directed and written by Girish Karnad, it reflects on the role of women in Indian society (to serve loved ones without expectations, and regardless of her own suffering) and also contains an environmental message relating to deforestation. The film was shown at the Cannes Film Festival. 2018: Filmfare Awards(Marathi), "Best Actress". "Kachcha Limbu"
2015: Filmfare Awards(Marathi), "Best Actress". "Dr. Prakash Baba Amte- the real hero"
^ "49TH NATIONAL FILM AWARD". Ministry of Information & Broadcasting. 26 July 2002. Retrieved 1 December 2011. ^ "So Kul - the book". 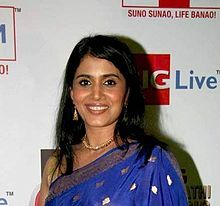 Sonalikulkarni.org (Official website). Retrieved 1 December 2011. ^ "Sonali Kulkarni Marries Second Time". Times of India. 25 May 2010. Retrieved 1 December 2011. ^ "Sonali Kulkarni gets best actress award for "Fuoco Di Su Me"". Indiaglitz.com. 11 April 2006. Retrieved 1 December 2011. This page was last edited on 14 April 2019, at 22:52 (UTC).